Over 1,000 new loan requests showed up on KIVA overnight. Lots of new places and places to make a difference (e.g. Haiti, Afghanistan). Might be a good time for new members and existing members to add a few loans. I made another one today. Just looking around, there are no Education or Health fundraising projects. Those are the ones I would personally give more to than others. I need to add, that there are no current fund raising for Education and/or Health but have been, most in the repayment phase. Last edited by chanp; Apr 10, 09 at 11:54 am Reason: correction. For some reason I had not seen this thread before. Count me in to the group. I've just linked my fourth loan to the FT "club". Goodonya, Craig! especially for the four loans, of course. 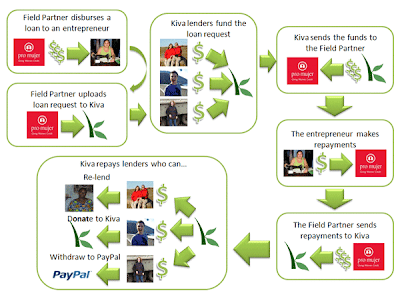 Thanks to JDiver for alerting me to FlyerTalk's decision to officially approve Kiva as an FT charity. That status is now reflected in the group description. Let's push the group over 100 members or $5,000 loaned by December! Hi, captain boulderlaw! We've made such great progress this year, I am hoping we can double your goal , even in this weak economy. We can dream, can't we? From ten members lending $1,375at the end of February to today's 40 lending team members / $3,600 is most encouraging! But we are just 1/3 the way down 2009, with such great events coming up as Thanksgiving (not to mention birthdays, anniversaries, memorials, etc.) to use as incentives or vehicles for lending and giving back a bit for all we have to be thankful for. How long does it take for loans to show up? I just joined and made two loans. Paypal shows that the loans were made. Kiva shows me as not having made any, and still has the two groups in my basket. There was about a 2 hour lag between making payment and the loans showing up for me today. Help push us over the top by recruiting a friend or making a loan. Every dollar and team member gets us that much closer. I joined the team today too. Time to make some loans. Goodonya, dartagnan! And SanDiego1K shows three loans now. Capt. boulderlaw, we are on the way - maybe to $5,000 by July 1? Now, that would be a great achievement for FT lending team members! We are growing thanks to members like you. o One new FT team member (maybe you!) already has 81 loans - (most prior to joining,) and I have to say that is IMPRESSIVE and displays a real commitment to help others. o One member has a link to this page in his Lender Profile - great idea! Now I've added the link to this page to my lender profile as well; thanks for the idea! o We're at $4,200 loaned this morning! I'm joining the team today.